This 1878 painting by Julius Hübner of Luther nailing the 95 theses is narrative art. 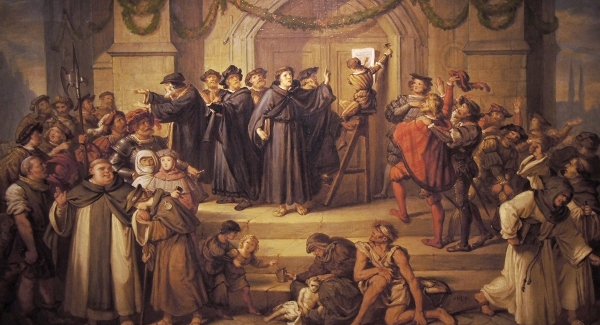 It depicts the story, showing Tetzel in the lower left receiving adoration and money from those who have purchased indulgences by enriching the pope. This is contrasted with starving people who could better use the money begging on the church steps. Luther’s disciples are on the left teaching the people and followers on the right receive his message with enthusiasm. Luther’s enemies are seen in the lower right running off to inform the pope. Of course, this is all fanciful. Luther probably hung the theses as a matter of routine to inform other scholars that he would like to discuss these points. It wasn’t until scholars realized that the theses implied a challenge to the authority of the pope that the document caused a stir. October 31, 2017: Today marks the five-hundredth anniversary of what has come to be considered the formal beginning of the Protestant Reformation. That’s because, on October 31, 1517, Martin Luther (1483–1546), then a Roman Catholic Augustinian monk and priest, nailed a notice on the door of All Saints’ Church in Wittenberg, Germany. He titled the notice, “Disputation on the Power and Efficacy of Indulgences,” but it became known as Luther’s 95 Theses.